Gift cards are big this holiday season. Americans are expected to spend over $26 billion on them, according to the National Retail Federation. And now, there's a new arrival on that landscape, medical gift cards, which Jack Gillis of the Consumer Federation of America says enable someone to help give "the gift of health." On The Early Show Friday, Gillis called medical gift cards "a very intimate, (targeted) gift, because this is the type of gift you'd have to know someone pretty well to give. "One of the things the company (Highmark, Inc.) is capitalizing on is the fact healthcare costs have gone through the roof. "More and more of us are in the sandwich generation. We would love to be able to somehow help our parents with some of their health care expenses, or our kids who are more and more not being covered by health insurance. "So, the company is betting on the fact that we will be willing to spend a lot of money on these cards and give them to people that we care a lot about." Gillis noted that the cards could make a good gift from 40-to 50-year-olds faced with the task of helping their parents without having to be too intrusive and without a handout. "This is a gift," he says. "It could enable someone to be proud." He says it "enables someone to give a gift to someone he or she loves and help them and be discreet. It's really the first of its kind." Highmark says its Healthcare Visa Gift Card "provides an easy way for consumers and recipients to cover out of pocket expenses related to maintaining personal health and wellness. "This . . . can be used for a variety of purchases, including co-pays for doctor visits, prescriptions, vision care, dental care, health club memberships and elective procedures." You can buy them in amounts from $25 to $5,000, whether or not the recipient has medical insurance. Gillis cautioned, "You don't have any control over what the person does with that card, so the hope is they will be actually using it on health care. ... There's a huge variety of places that'll take the cards. In fact, generally, they'll be accepted anywhere a Visa debit card is accepted. But the concept, I think, is a very good one." Also, he said, the cards "can be relatively expensive if you're only giving a little bit of money. For example, they cost $5 plus a delivery fee, so if you're only going to give someone $100, that's 5, 6, 7 percent right off the top of the card. "The other problem is that, with gift cards in general, we estimate that between 10 and 15 percent of gift cards never really get used. They get lost or you don't use the entire amount. "So, there's typical challenge associated with gift cards that are associated with these medical cards. But conceptually, it's a good idea." 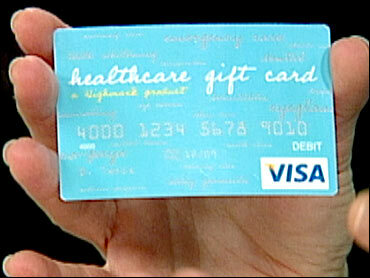 For more on medical gift cards, go to givewell.com.